We’d love your help. Let us know what’s wrong with this preview of Neighborhood by Hetty McKinnon. 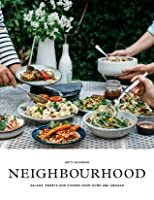 Neighborhood is a must-have collection of show-stopping yet simple vegetable-packed recipes, delivered against a backdrop of charming stories of food, family, and friendship. These delicious main-meal Hearty and healthy salad recipes inspired by neighborhoods across the globe. To ask other readers questions about Neighborhood, please sign up. Lovely cookbook with photos throughout. Flavor combinations are to die for, excited to get started cooking! The ‘hearty’ qualifier isn’t a misnomer, many of the recipes are high carb, high glycemic index. Forced to choose, I'd say the French chapter is my favourite. The dessert chapter comes a close second - I'm very tempted to try the easy slice recipes, the quick raspberry mousse made entirely in a food processor, and the olive oil and sea salt brownies might well prove life changing. Every once in a while when I want to treat myself I'll buy one and in this case I recently acquired Hetty McKinnon's Neighborhood because I'd heard so many great things and so badly wanted to try it. Neighborhood (her second cookbook) focuses on taking the schematic version of a salad (think: leafy) and works to change the schema so that salads become something new. More hearty, less leafy. To be honest her salads are so out of the realm of what I'm used to where salads are concerned I had to ke Every once in a while when I want to treat myself I'll buy one and in this case I recently acquired Hetty McKinnon's Neighborhood because I'd heard so many great things and so badly wanted to try it. 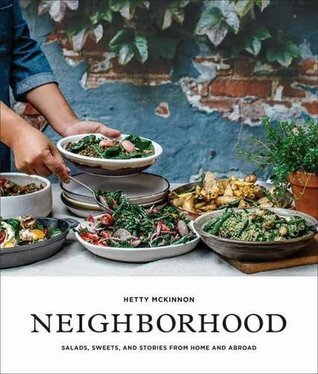 Neighborhood (her second cookbook) focuses on taking the schematic version of a salad (think: leafy) and works to change the schema so that salads become something new. More hearty, less leafy. To be honest her salads are so out of the realm of what I'm used to where salads are concerned I had to keep reminding myself that the basis of this book are, in fact, salads. Almost a dozen recipes in and I'm completely enamored with the way Hetty constructs a salad because what she does is make it into a true meal. She deftly shows how the differently places that she's lived in influence the types of ingredients she uses and how she uses those ingredients. The recipes, paired with Luisa Brimble's crisp and lush pictures create such a mouthwatering combination! I found myself coming back to an idea she mentions in her introduction: "If community is a feeling of kinship, Neighborhood is a physical compilation of the sights, sounds, and colors of a geographic area." What each recipe then becomes is the embodiment of all of these things because in all the places she's lived she's taken inspiration from. This is also how the book is organized -- into the different neighborhoods she's connected to: Dear America, So Frenchie, Into the Mediterranean, East, Meet West, To Asia, With Love, This is Australia, and Just Bring Dessert. Very helpfully the beginning of the book contains tips for weeknight salad making, how to use leftovers, and some cook's notes. I belong to a family of vegetarians (my husband, daughter, and I) and this is probably one of the reasons why I really started to take home cooking seriously is because I wanted to ensure that my daughter wasn't a cheese/pasta/tofu "vegetarian" like her parents were (also there was a huge fear from my extended family about what I would feed a vegetarian toddler so there was a lot of pressure to get it "right"). In some ways I wish I would have had this book to start off with because I love the way ingredients -- grains, beans/legumes, nuts/seeds, and gorgeous seasonal produce -- are put together to create memorable and hearty combinations. You could totally serve a kid salad (gasp!) without great grandma clutching her pearls (she'll mostly likely enjoy the salad too!). Neighborhood is categorized as "plant-based" and while dairy and eggs are used in limited amounts I think that whether you eat meat or absolutely none at all I think these recipes are easily adapted to suit any preference. When my sister and her boyfriend recently came for a visit I made them the Roasted Carrots w/ Green Beans, Mung Beans, & Coconut Dukkah (as well as the Salted Caramel and Apple Galette) and it was a HUGE hit! I'm always worried about what I'll serve non-vegetarians but with Neighborhood I think the recipes are so delicious that it transcends any labels. Just the other night I made the Bean Chili w/ Crispy Tortilla Strips & Creamy Avocado Salsa and my daughter totally gobbled it up! I really appreciated how the beans were mixed in with the cooked onions, garlic, and spices but that the tomatoes and bell pepper were left uncooked (to be mixed in after the pan was taken off the stove). These fresh elements somehow lightened the chili and this traditionally cold-weather dish became completely perfect for a warm summer's evening. The creamy avocado salsa was a good foil to the spicy chili and the crispy tortilla added a nice crunch. The leftovers were perfect because no re-heating was required -- this salad tasted great cold! Similarly none of her leftovers need to be reheated which makes getting a meal on the table so helpful. I found that the ingredients were easy to shop for because all I needed was to buy in-season produce. For the rest of the dry ingredients I was able to rely on my pantry staples for different grains, beans/legumes, nuts and seeds. One of the things that I admire about Hetty is that she advocates for the connections that happen between food and people. It's through these connections we learn about how neighborhoods are founded and sustained. I think the most special part of her book happens at the end with the last chapter Just Bring Dessert. It is here that she introduces us to her kin -- the people close to her. Each person brings a story and a recipe and it's through this collaboration between Hetty and her friends that the spirit of Neighborhood is strengthened. There was something about serving the galette on the final night of my sister's visit that made me so happy. The shared memories of that dessert and their visit are linked forever even after they departed. Making the classic pavlova recipe felt different because I was making Jennifer Wong's classic pavlova recipe -- one that was her mother's (it was also my first Pavlova recipe I tried and I was really happy with the way it turned out). This is not just a cookbook but a way to understand food and to experience its connection to any given place or people. What she states at the beginning of the book is the truth: "Neighborhood will show home cooks that you don't have to be a vegetarian to enjoy vegetables, and you don't have to be a chef to be a good cook." Her use of fresh, whole ingredients really works to change the way we see a salad and to make it one of the simplest, heartiest meals you can make. Not quite 5 stars, because these recipes are WORK with sometimes obscure ingredients. But totally worth it, such good flavor. Neighborhood is a 'salad-as-a-meal' recipe book full of delicious-looking salads with a wide array of exciting ingredients in surprising combinations. There are sixty-ish salad recipes, and ideas for using leftover salads that look good enough to be featured meals themselves. A favorite feature in cookbooks of mine, substitution suggestions, are included and can help to tailor a salad towards your/your family's tastes. This book does feature mainly grains and vegetables, but it does not state th Neighborhood is a 'salad-as-a-meal' recipe book full of delicious-looking salads with a wide array of exciting ingredients in surprising combinations. There are sixty-ish salad recipes, and ideas for using leftover salads that look good enough to be featured meals themselves. A favorite feature in cookbooks of mine, substitution suggestions, are included and can help to tailor a salad towards your/your family's tastes. This book does feature mainly grains and vegetables, but it does not state that it is a vegetarian cookbook. Also, the recipes usually include a dressing or topping, and could serve as a good base for adding meats and more cheeses if you absolutely must. Looks packed with flavour, and well worth a read. The Neighborhood recipe book features meal-salads from around the world. The photographs are as mouthwatering as the recipes! While not a vegetarian cookbook per se, most of the recipes focus on vegetables and grains. I appreciated the addition of suggested possible substitutions that allows cooks to use what is in their pantry or gives license to mix-it-up. Each geographic section of the book has standout recipes, but I was particularly enamored with the Pho Noodle Salad and the Chimichurri Sala The Neighborhood recipe book features meal-salads from around the world. The photographs are as mouthwatering as the recipes! Each geographic section of the book has standout recipes, but I was particularly enamored with the Pho Noodle Salad and the Chimichurri Salad Bowl. These recipes can be used as meals, side salads, or fantastic contributions to a potluck. A beautifully presented book full of wonderful vegetarian food from around the world. The book is separated into continents with flavours and ingredients that are popular within the area. The recipes are easy to follow, very healthy and look very yummy. And just to add to this book there is a section in the back with healthy desserts - what else could any one else want. A beautiful refreshing and well written book. I definitely needed a refresher course on making delicious salads and this book hit the spot! The collard greens with sweet potatoes, pintos and a paprika-buttermilk dressing was a hug hit in our house. Even the carnivores loved it! Ha. The photography is beautiful and the recipes are concise and easy. My husband and I eat salads twice a week. He is fine have lettuce, tomato and cucumber salad topped with a protein. i am the "experimental" one in our family who will try anything once. As my family has always said I look for the strangest this item on the menu and that is what I order. So keep that in mind when I say I didn't see a salad in this cookbook that I wouldn't want to try. At first glance the recipes look long and involved. But you have to remember that these are not your every day or My husband and I eat salads twice a week. He is fine have lettuce, tomato and cucumber salad topped with a protein. i am the "experimental" one in our family who will try anything once. As my family has always said I look for the strangest this item on the menu and that is what I order. So keep that in mind when I say I didn't see a salad in this cookbook that I wouldn't want to try. At first glance the recipes look long and involved. But you have to remember that these are not your every day ordinary side salads. These are the salads that are going to be your meal. While she not only offers recipes for the salads, there is a yummy dressing recipe to accompany each salad as well. And she seems to know that not all of us want to scour town for those more obscure ingredients as she has added substitute ingredients for us to use. This book may not be for everyone, but if you love a good salad and are bored with the same old lettuce and tomato, take a look. Couldn't wait for her new book to come out, its just as good as community. Everything is delicious and healthy!